Power and safety are the cornerstones of next generation Hilti TE 1000-AVR breaker. Utilising the company’s new HiDrive technology, which features a brushless motor, dynamic transmission and electronic power steering, enables the tool to create 26 joules of high impact energy and a hammering frequency of 1,950 impacts per minute. The Active Vibration Reduction (AVR) system cuts tri-axial vibration from 6.5 m/s² to 5 m/s², meaning the product can be used for eight hours per day before reaching exposure limit value (ELV). In addition the tool, when used with the TE DRS-B dust removal system and a Hilti M-class vacuum, removes up to 97% of hazardous fine dust from the point of impact for a safer, cleaner environment. The system also protects the machine’s workings, meaning continuous performance and reduced downtime. Productivity can be improved still further with Hilti’s recently launched TE-SP chisel, with features an innovative ‘wave’ design for more breaking power and less sticking, which in turn markedly increases performance. Applications include demolishing concrete and masonry at floor level or below waist level, corrective chiseling, removing tiles, bushing and compacting and renovating floors. Tom Clegg, Northern Europe Product Manager (Heavy Duty Tools) at Hilti, said: “To increase power is one thing but to significantly reduce vibration numbers with optimised levels of dust extraction – without compromising the weight of the machine – makes this tool a truly innovative development. The TE 1000-AVR can be purchased through Hilti’s Fleet Management programme whereby a fixed monthly charge covers all tool, service and repair costs over four years. For customers who prefer to own their own tools outright Hilti’s Lifetime Service gives a complete no-cost period of two years. 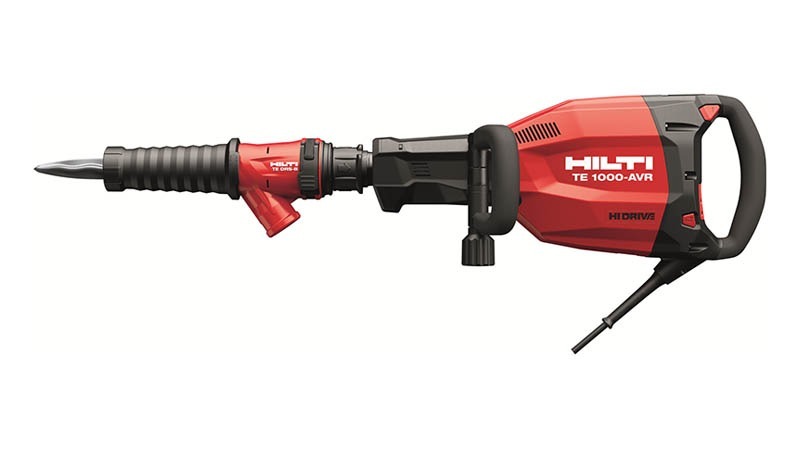 Find out more about the Hilti TE 1000-AVR breaker here: www.hilti.co.uk/te-1000.